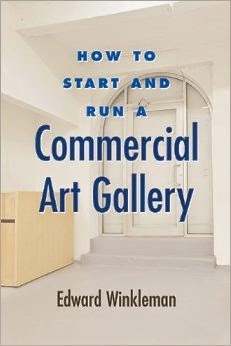 If only every potential career had such a well-laid out, thoughtful, and truthful guide book as Edward Winkleman’s “How to Start and Run a Commercial Art Gallery.” If you have the passion and the drive to open a retail gallery, this is a helpful guide. Winkleman writes as though he's speaking directly to you, and he lays some things out so simply that I feel like I could go start a gallery right now! A point Winkleman repeats several times throughout the book is this, “there are much easier ways to earn a living than by selling art. It is assumed, therefore… that enthusiasm and an understanding of the importance art holds for mankind play a major role in influencing anyone to open an art gallery” (26). Basically, do not open an art gallery with the sole goal of becoming wealthy. There are much better and easier ways to do so. However, as an art dealer himself, his argument is not that no one should ever open a gallery. I think he hopes to simply warn any possible new gallery owners to really consider their motives before beginning the task of opening their own business. Passion is key to loving your new career as an art dealer, he says. This book functions as a business how-to for the art inclined. As Winkleman points out, “having a PhD in art history does not guarantee that you’ll be any good at managing a small business, just as having an MBA does not guarantee that you’ll develop an eye for the kind of art that collectors will want to purchase” (1). Both business skills and artistic understanding need to be held to be able to successfully run a commercial art gallery. This means you must both be an expert in the type of art you are going to sell, and be savvy enough to run a business with little outside help. Winkleman discusses the basics of deciding on your gallery’s mandate, ensuring that you have the legal and economic matters covered involved in starting a business, how and where to find artists to represent, how to find and keep art collectors coming back, how to take part in art fairs, as well as many other topics in this 250 page book. As someone working for a not-for-profit art organization, many of the things he writes about are not applicable to my job. However, I do feel I now better understand the everyday work of the owners of commercial galleries, such as the Rouge Gallery in Saskatoon or Slate Fine Art Gallery in Regina. Interested in reading this book? We found it from the Saskatoon Public Library. Find it at a library near you here. You can also purchase it here. Winkleman, Edward. How to Start and Run a Commerical Art Gallery. New York: Allworth, 2009. Print.